Following on from my post last year on making your own wire free bra, today I’m going to take you through making your own Bralette. It’s a super simple sew, and you’ll only need a few things to make it look super luxe. Make sure the paper is big enough to get the full pattern on! Recycle your scraps! Trace around the Bralette front half; then open out so that the CB extends. Extend to draw the CB. This will be your basic pattern. Add on seam allowance (about 1cm) and pattern markings such as CF fold line and CB seam. I checked the strap length from my top, and added this onto the pattern also. 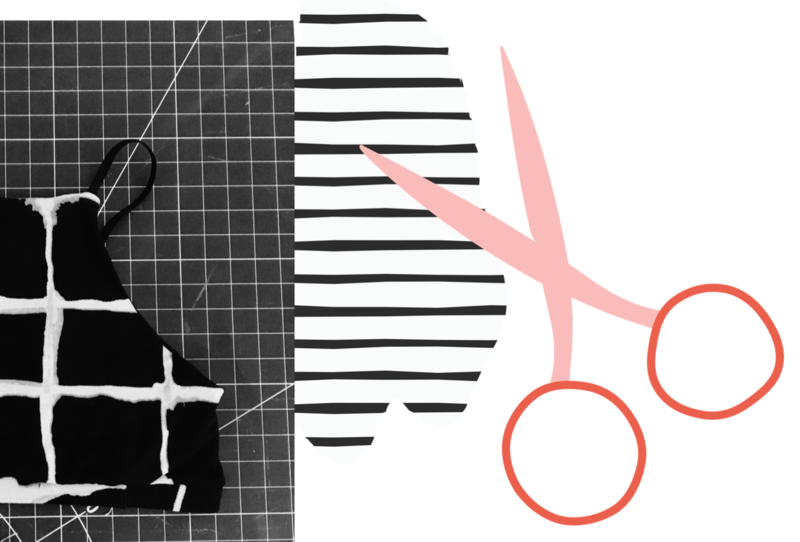 Square off the bottom, and CF and CB necklines with your set square. Place your pattern piece on one legging leg, at a fold (not at a seam, you don’t want a seam running down the front / or you could if you want! It’s up to you) and pin in place. Cut around and you have your main piece. Cut your shoulder strap length according to the measurement you took + 2cm for seam allowance. Measure your underbust, and cut your hem band an inch smaller – this is where you can carefully cut the WB from your leggings to reuse. Pin around the neck, armholes and back top edge (make sure the straps are not catching in any of the pins) and sew / carefully removing the pins as you sew. Leave the bottom edge open – flip out the right way. All the seams are enclosed! You are now ready to sew your hem band. Match the CB of the elastic with the CB of the Bralette, (right sides together) and sew on with a zig zag stitch / stretching on the elastic as you sew. I was having tension issues with my machine – but I actually like how the thread is showing at the CB! You are all done! How easy was that? I’d love you to share on Instagram if you follow this tutorial!